These beautiful Rustic lanterns, made of galvanized metal & glass, resemble the look of traditional European street lamps. They exude beauty and history with their timeworn look…With leather handle and rust antique style. 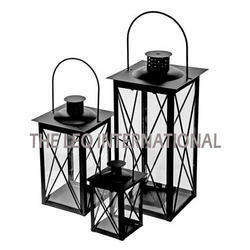 Made completely of iron, the Decorative Metal Lantern is made available in different sizes. The marbalised antique look, distinguishes it from the lot, a collector's item.